While Democrats in the state Assembly decided not to push for changes to the proposed state budget, their colleagues in the state Senate are planning to take a different approach. With debate underway in the state Senate, Democrats have so far introduced more than 30 amendments to the $70 billion spending plan. 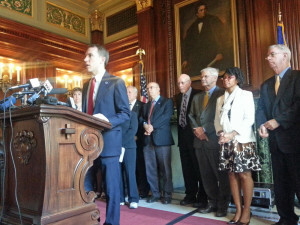 Senate Minority Leader Chris Larson (D-Milwaukee) says many of those proposals reflect what Republicans have previously said in opposition to different provisions in the state budget. He says the “welcome mat” is out for Republicans who want to side with Democrats on changing the budget bill. The Senate debate on the proposed two year budget bill is expected to run through this evening.